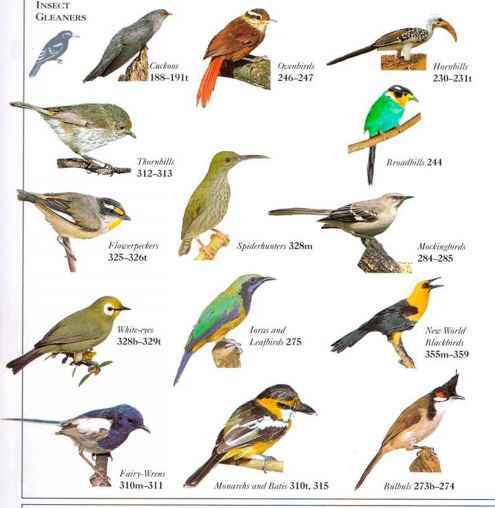 I his rain forest bird inhabits the foothills < mountainous regions and feeds on tree fruits and insects. Females and young males often forage in small parties, w hile the mature male usually feeds alone. He also performs his courtship display alone, choosing an open perch as a display flunk feathers site, and uttering a scries of plaintive call notes. Then, fanning out his blue belly and flank feathers, he drops upside down antl vibrates his body. He also rhythmically expands and contracts a special patch of rust-red and black plumage. While doing this he titters a throbbing, machinelike sound. The female-moves along the branch to perch between his feet, looking down on the display, until he swings back upright to stand beside her. • Distribution k. New Guinea. • UliMARK The male's long tail streamers account for the 13'/: in (34 cm) length distribution difference between the sexes.